After a year of Sidepodcast travels, we’re quite aware of our shortcomings when it comes to organisation. That said, we learn from our mistakes and in order to get the most out of a weekend at Autosport International, I decided we should literally spend the whole weekend at the show. Both days. That’s Saturday and Sunday. I was convinced it would be overkill – who needs to the same stands over two days? – but figured at least we would have the chance to capture all the footage, photographs and information we wanted. 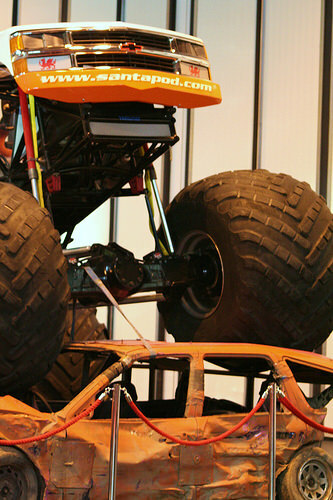 On Saturday, we based all our knowledge of the show layout on this monster truck. Imagine our surprise when we turned up on Sunday, and the truck had moved. It had only travelled a short way across the hall, but it threw everything right off. For a start, there was no apparent reason for the move, and then, how were we meant to know where we were? It really needn’t have worried us, because a lot of the stands had changed anyway. If we had known where we were, we wouldn’t have recognised it. I assumed that everything would be the same both days, but that’s my own fault for assuming things. On the bright side, more free stuff to collect. Another stand was devoted to the La Ciudad Del Motor and that was much more low-key. A TV screen, a couple of flyers, and a small gathered crowd saying: “I’ve never heard of this!” The difference is startling. Perhaps this is something I have never noticed about the show before, or perhaps it was new for this year, but there were a lot of things for kids to do. There was a karting track made out of bouncy castle, an entire roped off area devoted to Roary the Racing Car and colouring in, and more importantly, dodgems. Not something I expected to see, but fun to watch, all the same. The price was a bit of a turn off, and I’ve never been a fan of the crashing on purpose idea, so I didn’t have a go. In our travels, we returned to the main stage area, where Mark Blundell and Martin Donnelly were being interviewed. We’d missed the majority of the talk, arriving in time to hear the Q&A with the audience. It was an absolute revelation. Who would have thought Mark Blundell has a sensible opinion in his head? I’d always assumed he was the Lewis Hamilton fanboy that the rest of ITV appeared to be. Wrong! The audience member essentially asked who was to blame for Hamilton losing the championship, and Blundell said, straight away with no qualms about it, the boy himself. He explained himself, he had good reasons, he talked about decisions made by the team and by Lewis and, all in all, it was a fascinating answer. The idea that ITV may be blocking the rational thoughts of their presenters is something I think we will have to return to at a later date. 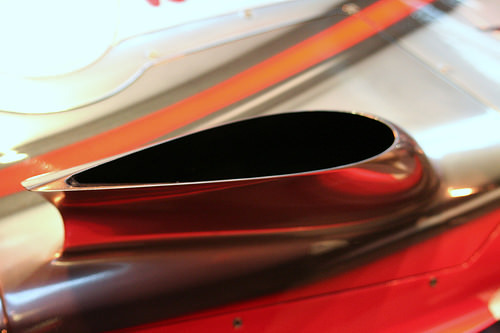 I’ve covered the main points of the show now, except of course, the most important – the F1 display. In the past we’ve had cars mounted on the walls, or lined up in a mock grid. This year, it was quite simple – the pit garages painted on the wall and a car sitting out in front. It’s nice to see all the cars together at such close range. At Silverstone, we got to see all the cars in action, and at Goodwood we got to be so close to some of them we could almost sit in them. At Autosport it’s a happy medium of all the cars being just close enough. 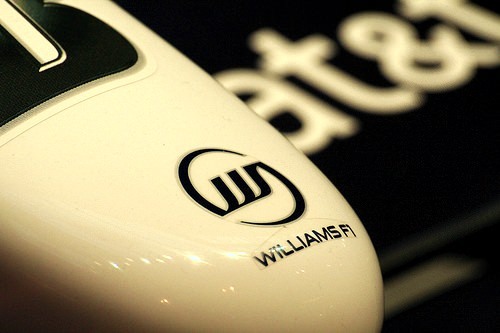 It’s fun to compare the cars side by side, and we got plenty confused about which cars were 2007 and 2008 (Williams and BMW, I’m talking to you), especially when you add 07/08 hybrids into the mix. As I gain more and more knowledge about the cars, I find myself noticing some of the more important (and let’s be honest, the more obvious) features. I’m starting to see what all the little wings and flaps and curves and bends do, and I find the amount of detail incredible. One tiny little dent in the chassis saves time on track, and it’s worth investing resources in research for that. Compare that to last year, when I was more interested in which driver’s helmet was in each car. This year, I was even entrusted with the camera to get the geeky shots! All in all, this year’s Autosport seemed to be much more interesting than previous years. Yes, alright, David Coulthard was there again but there seemed to be more to see and more to do. We still didn’t manage to get to the Live Action arena. There were plenty of F1 related things and people to keep an eye on. A certain person tells me that the quality of the girls was substandard to last year but that’s not what it’s about.